Google a lancé récemment une nouvelle application Field Trip. Cette application se base sur la géolocalisation pour fournir des informations sur les lieux, les promotions en cours autour de vous. Il n’est même plus besoin de regarder votre smartphone. En effet, si vous possédez un casque ou oreillette bluetooth l’application se comporte comme un audioguide… Field Trip tourne en tache de fond est réagit en fonction des alertes que nous fixerons. Beaucoup de ces services ne sont pas connus en France mais j’imagine que la firme de mountain valley va se lier avec des locaux pour la sortie en France de cette application. Tout ceci n’est pas sans rappeler un certain project glass… En effet pour le moment Field Trip affiche les informations sur notre smartphone mais dans la video (a voir et revoir ci dessous) les points d’intérêts sont directement dans le champ de vision et aussi dans les oreillettes des lunettes. J’essayerais d’avoir plus information le 29 octobre à ARparis dont la cinquième édition sera consacrée aux lunettes de réalité augmentée. Starting at Transmitter Park, the #fieldtripday team presented event registrants with a goodie bag containing a printed overview of showcased sites, a notebook, snack and Field Trip t-shirt. Participants could then follow a self-guided walking tour of sites in the surrounding Brooklyn area from 2-6 pm. Flagged markers along the way helped to orient the path. The afterparty started at 6 pm with snacks and beers from #BrooklynBrewery. Kudos to the staff for making this day so much fun and getting in the spirit. Especially those dressed in character from some of the historic locations. The app installs quickly on your Android device, and the setup wizard guides you in few steps.You can fine tune your experience through categories like Architecture, Food, Art, Offers and more. Within each category, you can also select specific channels for information. For example, in the Food category, you can select to receive info from Zagat. You can also set the « frequency » level that you want to receive notifications. Finally, three pages you can easily navigate with a thumb swipe include a general MAP with place markers, NEARBY for places in the immediate area, and RECENT, which is an historical list of places you’ve been to. The layout is clean and direct and not bloated. I am not a keep-your-nose-in-your-phone-while-walking kind of guy. Thankfully the app provides plenty of notification options for ring tones, lighting up the display, vibrating, or reading text to speech if you have your headset plugged in. I tried all four, and the vibrating option worked best for my use – best while keeping the phone held in my hand (keeping it at the ready not looking at it); and good experience with it in pocket on vibrate. Of the three dozen or so suggested locations, I visited about two dozen, and I would say there were about three times when I was NOT notified when nearing a location. A quick peak at the GPS alerted me that I had overshot the location and I had to backtrack a block or two. I don’t know if the approx 10% missed (and 90% success) in my sample experience is a function of the app, the phone or the location. Time will tell how that plays out on average. I tried this app with a new Samsung Galaxy Reverb from Virgin Mobile. Battery life has been good, but running the Field Trip app at full tilt, I only got about 4 hours before the phone ran out of juice. At least on my phone, it seems to be a bit of a drain. I will fine tune my frequency and interest choices to see if performance improves. The app delivers on its intention to provide local info while you are out and about. Having lived in New York for over 15 years, and only been to Brooklyn maybe 10 times, I definitely learned a lot about the area, and am inclined to go back and visit the businesses I discovered along the way. The ability to choose who feeds you the info is a welcomed feature – and makes me feel like I’m in control of the experience instead of getting spammed every 10 feet. I am such a light phone user, I don’t know how much this app will come in to play in my daily life. 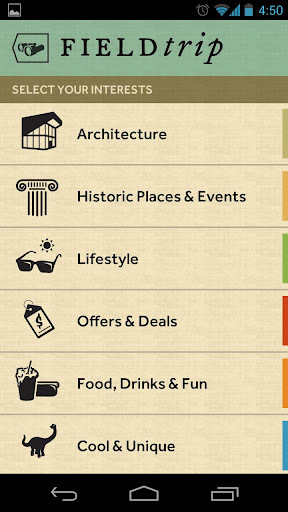 But for visiting an area, exploring it, and finding restaurants and businesses, I will absolutely turn to this app. Ability for users to create a customized Field Trip to share with people (not unlike creating a custom map in #Google Maps). En tout cas, la vidéo de promotion n’est pas très claire … Ou je suis ne seul à ne rien comprendre ? “The idea behind the app was to build something that would help people connect with the real, physical world around them,” a vice president of product, John Hanke, told the New York Times.